Aside from that, I've been experimenting with borosilicate glass... one tough cookie! But there have been some successes that I'm rather pleased with. I'll be back on the torch this afternoon trying out some new colour ideas.. wish me luck! I've been having some fun playing with different bracelet designs recently.. and I think this one is my favourite.. it's always good to play with different colours and shapes & come up with something new, and this is the true genius of this style of jewellery.. when you're bored with it, take it apart and make something new! I came up with four different looks in half an hour (check my Flickr pages to see the rest!) .. Very cool! Well I have lots of new beads to list, but unfortunately the weather isn't co-operating with sunlight to take photos.... we have overcast conditions forcast for the whole week, and without nice bright daylight, I can't get a good pic. So, I wait... 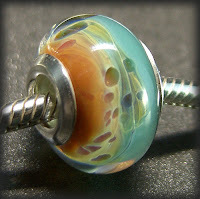 There will be new beads up as soon as some sun peeks through! Some of you might not know this, but Nigella is my hero, I abolutely love her! So, when I heard she was going to be in Sydney for a book signing, I was THERE!! ... along with a few hundred others of course.. ! Now this woman looks absolutely incredible ... not a line on her face, must be all that good food! My resolution this week is to try some of the recipies from the book, lots of yummy food to try... and not have the book sit on the shelf ..
Well after many, many requests, I now have Biagi sterling logo bracelets available ! I will carry three sizes to start with.. and if you need a particular size, be sure to let me know and I'll gladly order it in for you..
just follow the link, www.nelliemae.com.au for ordering details. Lots of new bracelet beads have been listed on ebay with more to come tomorrow also. A bead & glass obsessed artist from Sydney, Australia. This is a Flickr badge showing public photos from nelliemae. Make your own badge here.